Certain computer games have established a cachet so great that you almost don't have to say anything about them. The games were so fun, so addictive, so interesting that a certain generation of gamers just know, from the brief incantation of the game's name, that you're part of the brotherhood. If you don't, imagine the game that went beyond any science fiction book, TV show, or movie. You were in charge of a civilization clawing its way into the galaxy. Colonies on other planets! Space exploration on a galactic scale! Scientific breakthroughs! Aliens! Space battles! Add some diplomacy, economics, politics, and you have the recipe for one of the most engaging games you've ever played. Unfortunately, the pinnacle of space empire bliss, Master of Orion II, was published 12 years ago. The third in the series degenerated into a tedious accounting exercise, and would-be heirs just didn't have the alchemy of Master of Orion. I'd say more...But I have an empire to run. I have a lot of respect for people wargame designers, the poets of military history. Designing wargames isn't like writing a book, in which more detail means greater accuracy. Wargames are supposed to be played, which means there's only a limited about of complexity you can cram into a game before it becomes unplayable. Therefore, you pick the details that you think matter. You pick game mechanics that fit the subject. For example, ancient and medieval battles normally ended when one side's morale broke. High casualty rates in battles like Cannae were far and away the exception. Therefore, if you're designing a game depicting the important battles of the Hundred Years War, you don't want to pick game mechanics (usually involving a lot of die rolling) that ends with unhistorically high levels of carnage. With a limited amount of rules that any player can learn, you therefore want to pick ones that capture the essence of what you're simulating. For ancient and medieval battles, you want morale to be the deciding factor. You might also emphasize the limited command and control that the army commander had, especially once formations started moving and fighting. Too many added details might actually get in the way of telling the story of a battle through the game. Interesting innovations happen when you can't borrow mechanics from earlier games. For example, about 15 years ago, Mark Herman, who had designed dozens of wargames, was thinking about how to make politics and historical events an important, vivid part of a new game about the American War of Independence. His Big Idea was a deck of cards that the players used to move their leaders and armies, drop "political control" markers around the map, and trigger important events like the Declaration of Independence and the French entry into the war. Today, the wargame market is flooded with "card-driven" games covering conflicts as varied as the Thirty Years War, World War I, and Napoleon's "Spanish ulcer." Realistically, game designers also have to think about making the game interesting to play, not just historically faithful. You have to consider how long it will take to play the game, and how much "down time" one player suffers while the other player is doing something. You have to reach the right level of aesthetic appeal to engage the eye while the brain is churning away. Playability is especially tricky, since most conflicts, from the grand strategic to the tactical, have favored one side over the other. "Nearly-run things" like Waterloo are the exception. Finding ways to make the game challenging and interesting to both sides often demands a lot of cleverness. Wargames, therefore, pack a lot of meaning into a constrained medium. They have to be interesting, evocative, and often provocative. They have to capture something truthful and essential. They are, in these ways, the poetry of military history, which complement the prose of books and articles. As you might guess, I don't agree with this depiction of the French in WWII. 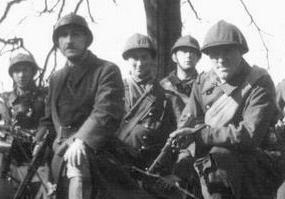 While the French military in 1939 and 1940 had its share of problems--for example, it had not finished the doctrinal and organizational changes needed for modern mechanized warfare--it's unfair for the game designer to extend the blame to the poor bloody French infantryman. By the admittedly few accounts I've read, the French soldier was not as abominably trained, equipped, or led as, say, the poor schmucks in the German Ost battalions. Though the Italians often get caricatured, too, I'd be hard pressed to say that Italian infantry units were markedly better than their French counterparts. Maybe I'm slightly less ignorant, or slightly more ignorant, about the French army in WWII than the game designer in question. However, both he and I have a hard time finding a lot of information on that topic, so the difference isn't likely to be substantial. Most standard accounts of the Battle of France are largely written from the German point of view. You might find some very high-level information about French strategy in 1940, such as the interesting historical fuss that Ernest May kicked up in Strange Victory. (Was it more "strange" that the French lost, or that the Germans won?) However, in May and other widely available accounts, you won't find a lot about the organization several levels below Gamelin or other French military leaders. It's important, therefore, to know what you don't know in military history--or any history, for that matter. For example, I used to joke that Liddell-Hart's history of WWII was originally titled, How the British Muddled Through and Were Really Responsible for the Allied Victory. No surprise, though, since Liddell-Hart was writing about what he knew, Great Britain's part in World War II, particularly in the European theater. Historians write and draw conclusions based on what they know. Whether the topic is the French army in World War II, or the Iraqi insurgent groups today, we have to be very, very careful about how our covert ignorance, even more than our overt biases, can distort our understanding. * For the wargamers reading this post, Combat Commander depicts command, control, leadership, and troop quality through the cards used to take actions. Just as important as having a big hand of cards, and therefore a lot of choices, is the discard rate, which can help you when all the choices fate has dealt to you are bad. The discard rate for the French and Allied Minors is one card, the lowest of all nationalities in the game. Since I've been a wargamer since my teens, it's perhaps a bit odd that I've never tried designing a game myself. It's never too late, I guess. During my morning crawl around favorite web sites, I spotted this list of top-notch military history books, with matching top-drawer wargames. If you're a military history buff who has never looked into wargames before, this might be a good way to get your bearings in that hobby. Plus, many of the book recommendations are worth writing down. Has anyone noticed that it's hard, in chain bookstores, to find books about the Italian Renaissance? Weird. Every student of my generation learned somewhere between kindergarten and high school that modern Western civilization started during the Renaissance, but try finding a good book on the topic. That's why I was happy to find a library copy of Princes of the Renaissance by Orville Prescott, a book I highly recommend if you're interested in the period. It's a readable narrative history, focused less on the usual names (Medici and Borgia) than on some of the other important ducal families (for example, the Sforzas, Gonzagaa, and Malatestas). If you see this book, snap it up. Having read it, I better understand the mindset behind one of my favorite boardgames, also called Princes of the Renaissance. In that game, you play one of five condotierri families that neatly coincide with the families covered in Prescott's book. The Borgias and Medicis make an appearance, but in a somewhat different way than you might expect. Since you play a condotierri, you're trying to snap up the opportunities that these rival families, and the warring cities they rule, present. It's clear that the game's designer, Martin Wallace, read and enjoyed Prescott's book.